How do I get (my) kids to go to church?! This picture kind of scares me. But, hey, kids in church! Why are they crying? Is it that bad?!?! This past fall I received quite a few emails that went something like this, “I really want my child to be involved in campus ministry, but s/he just isn’t interested? What can I do?” Pastors, youth directors, church leaders and parents hear and ask this question a lot. How can we get kids and young adults to a) go to church b) not hate it and c) keep coming into adulthood? As the church frets about declining numbers, it is a reflex to try to do whatever we can to get young people in the pews. We start new programs, look to hire young pastors, change worship and do all kind of things to get children and young adults into the doors. Parents cajole, they bribe, engage in yelling matches, and I don’t know what all to get kids to church. For generations, church was something people just did. There was immense social capital involved in going to church and not going to church made people wonder if there was something wrong with you. This is no longer the case. We cannot assume that young people will come to church or that once they leave they will come back when they have kids. Some will, but, for many, when they leave the church as a teen, they will not come back to us. Because they don’t need to. They can have their community needs met elsewhere, they don’t need church for career connections and, for far too many, haven’t seen life in the church as being any different from life outside of the church. As a campus pastor, I think about this a lot. Getting college kids through the door is a really, really difficult thing to do. As I have conversations with youth workers, pastors, and other people of faith about the declining presence of young people (and, um, just people) in our congregations, I have a few thoughts. When I talk about young people, I mean babies to 30’s, ’cause that’s all young in church world. 1) Why do you want young people in your church? Seriously, why? Is it because you are afraid the church is dying and, if we don’t get them in the door now, our centuries old way of doing things will die? If that’s it, find other reasons. Young people can sniff our desperation and they know that our desire to have them in church is far less related to who they are as human beings than it is to our need to play the numbers game and justify both our current existence and salvage our future. And they aren’t interested in propping up an institution at all, much less for the sake of just propping it up. What are some good reasons to want young people in church? They ask amazing questions and challenge assumptions. This can be really hard, but also, if they are listened to, can bring about much needed change in church. Old things may die. New life will happen. Young people bring a different kind of energy to church and are really excited about community and intergenerational life. Young people are a part of a cultural shift that we as individuals and a church need to understand. We can’t understand “kids today” if we aren’t talking to them. Because they are children of God and a part of our family and it is sad when part of our family isn’t around. 2) Why do you want your kids (or any kids) to go to church? Like the former question, do you want them to go because they should just go? Because you always went? Do you even know why you want them to go? If you haven’t thought about it before, take some time and think about why you go to church. What does it give to you? How does it feed you? What is the importance of gathering weekly with a group of others seeking to praise God and to hear God’s word in our lives today? Once you have figured some of that out, tell your kids. Tell them why faith is important to your life and how the church community has fed your faith and your life. Tell them again and again. Tell stories of times when faith lived out in community has helped get you through something hard, has connected things for you in a new way, helped you celebrate… If you don’t know why you go to church, you won’t be able to pass it on. If the children in your life don’t hear stories about the importance of Christian faith lived in community, all they will see is a rote attendance out of obligation. Most young people just aren’t into that. They are seeking, and if they know that you are seeking, that church has helped you in your journey and you want to journey with them, that can go a long way to encouraging them to develop a faith life of their own. This is a huge thing for me. I grew up going to a church that I love dearly. I always felt cared for and supported. I also grew up in a church where I was shuffled out for Sunday School. I didn’t know this at the time, but I implicitly learned that church wasn’t for me. To this day I struggle to sit through a whole church service (if I am not leading). In high school, I tried to help out in the nursery, at coffee hour — whatever I could do to not be in church. I am not the only person who has had this experience. This is a story I hear again and again — I have even heard kids say that that is how leaving church makes them feel. If you are in or lead a church that takes the kids out of worship for Sunday school, YOU ARE TELLING THEM CHURCH IS NOT FOR THEM, implicitly teaching that church is for grown-ups and they are not needed or wanted in church. You are also (probably) creating a worship service that is strictly for adults, so if the kids came back in, they would have little to do/relate to and few role models for leading worship. There are a ton of ways one can make church work for kids — from setting expectations that they will sit through the service to creating play areas in the sanctuary to involving them in worship from a young age. I have seen very high liturgy churches do this as well as churches that are lower on the liturgigeek scale. There are ways to make young people feel included in worship that fit every church. Include a young person on your worship and music committee, find out what they would like to see in worship and how they like to praise God. Keep them in worship. Help them participate and see that they ARE a part of the church and worship IS for them too. I know this is to every parent’s discretion and I don’t know your kids, but my experience with kids is that when you make them do something they don’t want to do repeatedly, they just come up with more reasons to hate it. Express to them why it is important they go. Maybe make it into a family outing once a month followed by an awesome brunch or something fun. But, at some point, if you feel like you are driving them further and further from church, maybe let it go. Have faith conversations. If your kid doesn’t believe in God, talk about why. Some people just don’t have the faith gene. However, their doubt could be a huge gift to your family and your church by asking questions that need to be asked and starting deeper conversations about faith. 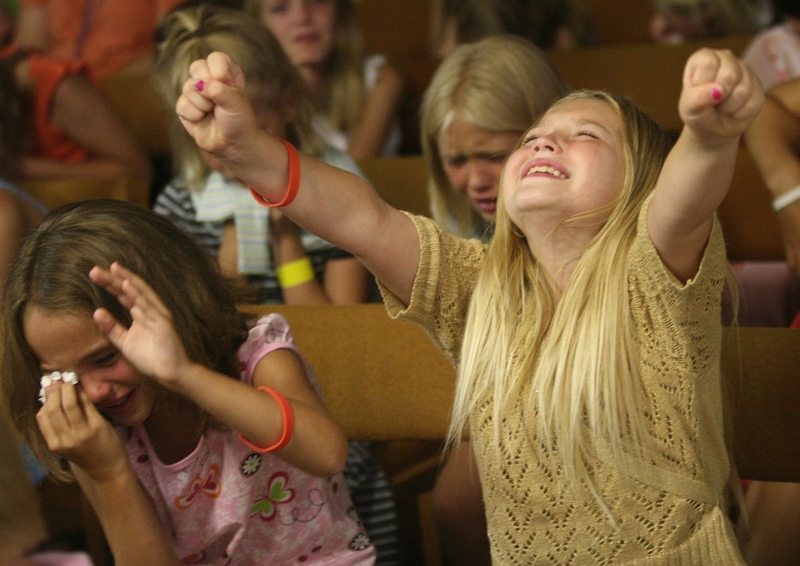 If your kid just hates worship, find out why. See if maybe they might be interested in trying other churches or if you can bring up your kids dislikes with the pastor (if they are reasonable). Faith exploration is a healthy thing, and maybe you can have some awesome new experiences too. As I said above, young adults can get a lot of the things previously provided by the church, such as community and connections, in many other places. What they can’t get elsewhere is Jesus. What we need to do as a church body — pastors, leaders, parents, everyone in the congregation — is to communicate to young adults why Jesus makes a difference. Sermons need to be good: to challenge, to exhort, to praise, to make the readings applicable to what people face in their daily lives. Churches should help young people (all people) develop a life in the spirit that changes, moves and guides them through every stage of life. Church has to be more than a social club and to provide more than good music and sacraments. Are we teaching our children to pray beyond the Lord’s prayer? Are we teaching them the purpose of prayer? Are we helping them draw connections between worship, prayer and service in the world? If we are not doing these things, if we are not showing them why a life in Christ matters, we are just another extra-curricular activity that is way too early on Sunday mornings or conflicts with stuff that will help them get into college. If we are, they know God is working in them them in ways that they know will help them walk through life and shape them into people who will spread God’s love in the world. They know that they are in community with others seeking God, people they can share their story and life with. That is something to keep coming back for. In the 80’s and 90’s there was a huge move towards splitting everyone up for age appropriate programming. This makes sense — different ages have different needs, and not everything is developmentally appropriate (or possible) for kids. However, this move separated youth from adults and created a chasm in our congregations. Now, in may places, youth barely interact with their elders. Intergenerational relationships are deeply formative. Some of my best memories in church are Mr. McNerney, who sat in the pew in front of my mom and I, checking in on how I was doing. So many of the older members of my congregation were mentors for me, second grandparents. I cherish those relationships and knowing that those people cared about me deeply. Find ways to bring those relationships back to church if they don’t seem to be naturally occurring. Start a mentoring program. Invite older members to help out with youth events, create opportunities for relationships to be built across age groups. This will show younger members that the adults care, show older members that the youth are integral to the life of the church and have really good ideas, and help share stories and build relationships that will help guide and nurture faith for years to come. I cannot tell you how many incredibly discouraging conversations I have with youth and youth workers about how their views are treated in church. I have talked to young people who have been laughed at and shouted down in council meetings, as well as young people who are constantly told they should be on the youth committee even if that isn’t where their gifts, skills or desires lie. Here’s what that says, “Your voice doesn’t matter. Your gifts don’t matter.” I have talked to youth workers whose announcements get pushed out of the bulletin or announcement time because of time/space. Here is what that says, “There is no room for young people here.” I know this is redundant, but if you want young people in your church you have to actually want them in your church as more than just a number. You have to want them as full human beings and allow them to participate fully in the life of the church. That means young people on council and in committees, it means lifting them up in prayer and in announcements, and having them serve in various ways in worship and service as soon as they are old enough to do so. If you have youth staff (paid or volunteer), show them that they matter. Work with them. Help them go to trainings. Too often, being a youth director means you are at the kids table. This helps no one. Invite your youth staff to the big table. Invite the kids too. After all, we all share the meal. Together, at the table, as the full body of Christ. Let’s set the table together.